ANDREAS Mikkelsen led Rally Sweden after a dramatic opening leg on Friday in which teammates Sébastien Ogier and Jari-Matti Latvala both went off the road while leading. 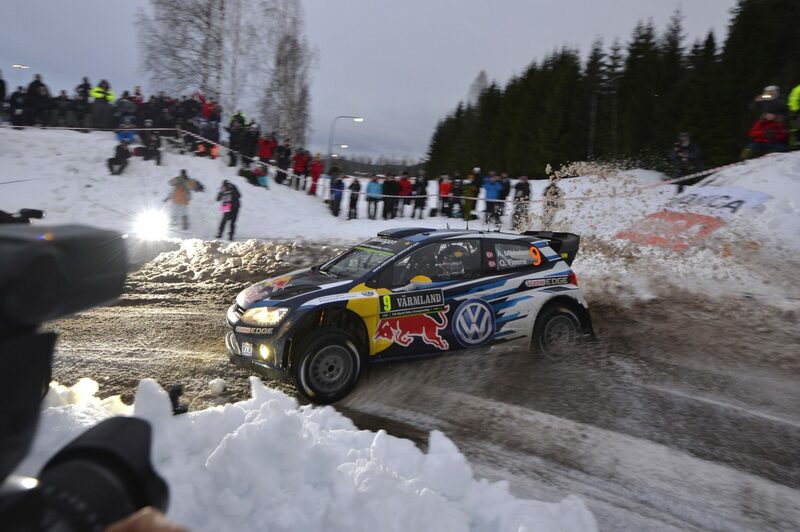 Mikkelsen battled handling issues on snow and ice-covered forest roads in Sweden and Norway to hold a 19.1sec advantage over Thierry Neuville, putting himself in a strong position to net his maiden FIA World Rally Championship victory. The Norwegian clipped a chicane with his Volkswagen Polo R early in the day and was astonished to leap from third to first following the troubles that befell championship leader Ogier and Latvala in the penultimate special stage. “To be in Norway, with so many local supporters, gave me lots of motivation,” Mikkelsen said. Ogier won three of the opening four stages to build a near-10sec lead but faulty windscreen wipers allowed Latvala to close. The gap fell to a second when Ogier’s bonnet flipped up and cracked his windscreen after he forgot to secure it while trying to repair the wipers before the test. Then he became stuck in a snow bank after braking too late for a junction and dropped 40sec before regaining the road in fourth. For a few brief minutes Latvala led, but the Finn ditched his Polo 400 metres from the finish of the same stage. It took spectators over eight minutes to manhandle the car back onto the road and he ended the leg in 23rd. Neuville endured a frustrating morning as conditions benefited the earlier starters, but the Belgian steered clear of trouble in his Hyundai i20 to overhaul Mads Østberg and the Volkswagen duo in that penultimate stage. The gap between the pair is just 0.3sec. Østberg fought tooth and nail with Mikkelsen throughout the day but dropped time this afternoon left him 19.4sec off the lead. Ogier is 5.3sec behind Østberg, while Ott Tänak overcame an early morning off to climb to fifth in a Ford Fiesta RS. Hayden Paddon was sixth, the Kiwi effectively driving the injured Dani Sordo’s i20 with the Spaniard’s set-up, and he struggled initially to find confidence in the handling. Martin Prokop lost fourth gear in his Fiesta RS but the Czech was seventh, ahead of Ukraine’s Yuriy Protasov, who claimed his maiden stage win. Henning Solberg and Elfyn Evans completed the leaderboard, although the Welshman was sixth until he beached his Fiesta RS on a snow bank. Kris Meeke lost three minutes after going off while debutant Kevin Abbring dropped 90sec when he left the road after his glasses steamed up. Robert Kubica drove most of the afternoon with only front-wheel drive while Lorenzo Bertelli retired with driveshaft issues. Saturday’s second leg is the longest of the rally. Competitors face eight forest stages covering 134.82km near Hagfors.